Seussical is a musical aimed at all the family and based on the works of Dr Seuss. It tells of Hornton the Elephant who hears tiny voices coming from a clover. These voices turn out to be JoJo and her family who live on a tiny planet on this clover. Hornton sets out to save them. 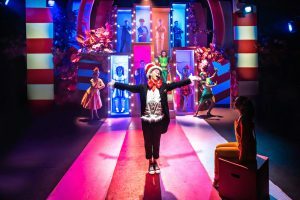 Along the way the audience meets a whole host of characters from Gertrude, a bird with a tiny tail to the Wickersham Brothers, monkeys out to cause trouble, all told by the Narrator – the Cat in the Hat. This production of Seussical is simply bursting with energy and life. The characters explode onto stage, capturing the audiences imagination, young and old alike. The show opens with the Cat in The Hat, played by Marc Pickering. Cat in the Hat is a character that says very little but does all of his talking through his expressive face and comedic body language. From the moment he begins the audience know they are in for a good show. All of the characters in Seussical are larger than life and this is wholeheartedly embraced by director, James Tobias. Scott Paige is an adorable Hornton who you can’t help but feel compassion for, especially after he is left holding the baby….well egg. Contrasting to Horton is Mayzie and the Bird Girls who preen their way through the show. The songs are all catchy and pitched well at the family audience. Originally Seussical was written as a two act show but this version is condensed into 75 minutes. This means the show moves swiftly from one musical number to the next. Consequently the younger members of the audience have little opportunity to get bored. The songs range in style from the hauntingly beautiful ‘Solla Solew’ to the energetic ‘Biggest Blame Fool.’ The cast are all gifted with a vocal ability that suits their character perfectly. With the sassy Sour Kangaroo played by Ngozi Ugoh who has a soulful voice to Amy Perry who plays Gertrude with a classic musical theatre voice which you can’t help but fall in love with. The choreography by Chris Whittaker is clever and I particularly liked the repetitive motif for Jojo and her family. The larger than life characters deserve a larger than life set and costumes. The set, designed by Justin Williams and Jonny Rust, is made up of a selection of human (or bird) size brightly coloured boxes with lights around them, a staircase and an upper level. This creates a huge amount of visual interest, allowing cast to pop up on the upper level and descend down the staircase when needed. The costume continue along the theme with the Bird Girls in a bright neon green with feather trim, Jojo and her family in yellow and her mother, the mayor’s wife in a particularly well turned out yellow dress and hat. 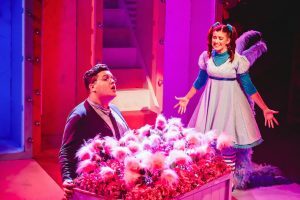 One of the shows biggest strengths that wrapped up in all the colourful costumes, silly songs and rhyming couplets is a message of acceptance, kindness and embracing individuality and imagination. It’s a show where birds fall in love with elephants and kangeroos and monkeys can be friends and maybe a message that we can all learn from. 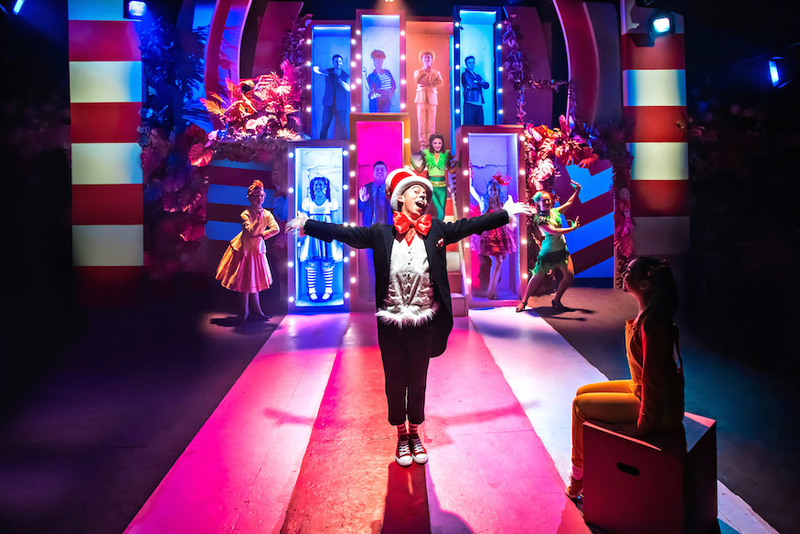 Seussical is playing at the Southwark Playhouse until the 29th December. For tickets visit their website. If you like this review you might also like my review for Dr Doolittle, Stick Man and School Of Rock.